Social media managers should pay special attention to the new header image. Twitter suggests using a profile header image that is 1,252 pixels by 626 pixels for optimal display across all possible devices. It's the first thing your customers will see when visiting your page. Don't use it to sell or simply slap a logo up there. Be creative, make it unique and send a message. Also, design around the profile photo, as it's centered in the middle of the image. You have this space to tell your story, amaze people and brand yourself or your company. Just like you have to make 140 characters count, make this image count. The opportunity to overlay a 160-word bio. Your bio literally floats over your profile photo image, so make sure to tie the two together. Because the image will draw attention, your brand's bio will be an even more important message. "Pin" your favorite tweets to the top of your profile. This is a way for you to highlight content that's important to you or your brand and get it in front of your followers. Photos stream below recent tweets on mobile devices. Users can see a stream of photos below recent tweets on iPhone, iPad, and Android. You can swipe through them and tap any picture to enlarge it. This makes the way people consume content on Twitter more visual, which in turn can motivate actions and interactions. Not only do these changes allow users to spice up their profile pages, it enables marketers to more fully showcase their brand's personality and vibe, and gives customers a more dynamic user experience. 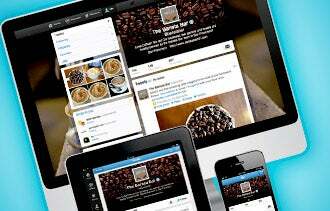 How will you take advantage of Twitter's new profile page design? Let us know in the comments below.